Arriving in Valencia this weekend for the next round of my first season in Formula 1 means three things: it’s a new venue that I need to acquaint myself with; it’s another street circuit which makes its learning curve difficult but more enjoyable, too, as I love racing so closely to the barriers and within tight chicanes and corners; and, on a personal level, that this round is interesting due to what it represents. While this isn’t the first time that the Valencia round has been held in Formula 1, it is still interesting to consider because of what it means. Technically, this round is classified as the European Grand Prix because Spain already has a round in Catalunya and Bernie Ecclestone -- the head of Formula 1 -- doesn’t allow two rounds in the one country. 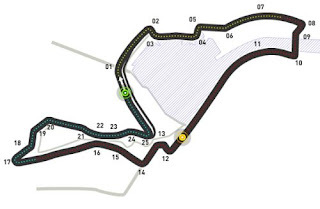 Previously, the ‘European’ round has been held at tracks such as the Nurburgring GP circuit in Germany but since that now alternates with Hockenheim each year, the new round takes place here in Valencia and on the still reasonably new street circuit that was built along the harbour. This particular venue is also interesting because it represents what a modern F1 race circuit should be, with exceptionally smooth tarmac, wide corners and long straights; carefully placed marshal points and easily visible LED screens for when the track is under yellow conditions or there’s a red flag; and a unique visual style that screams modern rather than the well-worn appearance of classic tracks such as Canada or Australia, or even the still relatively young (but not compared to Valencia!) venues at Malaysia and China. It is almost an insight into where Formula 1 racing will be in the near future, if you will, but regardless of that it’s an interesting circuit to consider because it is visually distinct, and because it’s such a contrast to some of the recent rounds we have had. Naturally, it is even more impressive for someone like me who is new to the circuit and has only seen it on TV previously, so it should be fun driving those first few laps in P1. Also notable this weekend is the presence of the press or, rather, how much more people there appears to be when compared to previous rounds. I have been asked for interviews and have had cameras following me around a lot more than any other round prior to this one, so is that something exclusive to this round only or are people starting to notice me after my great performances in Turkey and Canada? Speaking of which, at the end of Canada I honestly thought that I would be kicking myself a little bit for some of the mistakes I made during the race and that, as a result, I might be feeling a little less enthusiastic for this weekend. Instead, I’m feeling fantastic and I can’t wait to get out there and tackle the street circuit for the first time -- am I maturing as a driver by having a much more relaxed, motivated attitude or am I just going through a decent and positive period right now? Either way, I’m going to enjoy it while I can. As seems to be the case every race weekend these days, I got some laps in early whilst everyone else was focusing on preparing their cars and running installation laps. This gave me a chance to get familiar with the track while it was quiet, which was nice, and to begin learning what makes it unique as well as what it takes to put a decent lap together around here. Valencia appears to have a good flow but it is also incredibly busy -- there's a lot of corners, 25 in fact, and as a result the lap is rather long when compared to some of the other venues we've visited thus far this season. Even the straights, of which there are three main ones, feature steering wheel input of some sort as they turn slightly as you progress down them. These corners, including turn 1, can be taken flat out of course but it's still worth mentioning because there's little time or room to take a breath around the lap; it's maximum concentration, all of the time, and for a longer period than other venues -- exactly what a street circuit should be. The track looks sleek, too, despite our driving perspective being so close to the ground and the barriers obscuring the view. It's somewhat pleasant, in a way, to be driving along the lap and realising that you just passed a couple of luxurious yachts while doing so. I like the contrast of raw speed against blissful exuberance. My initial laps weren't entirely perfect, though, the usual mistakes and run-offs that always happen when learning a new circuit occuring as you would expect. I also got confused in one corner (I can't even remember which one), taking it far quicker than I should have. 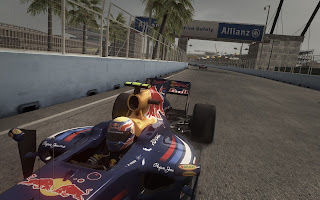 This resulted in some front wing damage after I clipped the outside wall and was sent careening into the opposite one. This ensured some lost time in the pits, too, as the team got to work on fixing it. Subsequent runs brought to light some issues with traffic, as well as personal problems with turn 2 -- I ran wide and off twice there while exiting the pits because it sneaks up on you so fast -- as well as turn 10 which is the hairpin coming off the bridge, and the final and very tight corner leading onto the front straight. I also ran wide at turn 4 and had to completely back out of things as I had to cut turn 5 in order to get back on track. No penalty, though, because I slowed right down. I also had some minor struggles with turn 17 at the end of the second back straight, as well as an amusing moment when I recovered from running off at the corner at one point: I had to let a gaggle of cars through upon getting back on the circuit and couldn't help but laugh at them because they have all the room in the world on this long track and yet they're all together like that? Why waste your potential behind other cars when you can find plenty of space if you just wait a bit? It didn't make sense and I chuckled as a result, but it is their weekend that is (or could be) getting affected, not mine, so it's not my problem. My third run was about tinkering with the car's setup as well as taking care of Virgin's R&D requirements. They wanted a lap time of 2:12.622 to test for a new throttle map setting, another time that was easy because I had exceeded that well before I even attempted it, probably even achieving it on my first lap around this new (to me) circuit. That's fine, though -- I prefer lenient goals like that because it means I can get them out of the way and focus on other things, such as testing what the changes we made to our setup did to the car and, of course, it gives me a chance to learn the intricacies of the place, too, particularly important at a track like this. 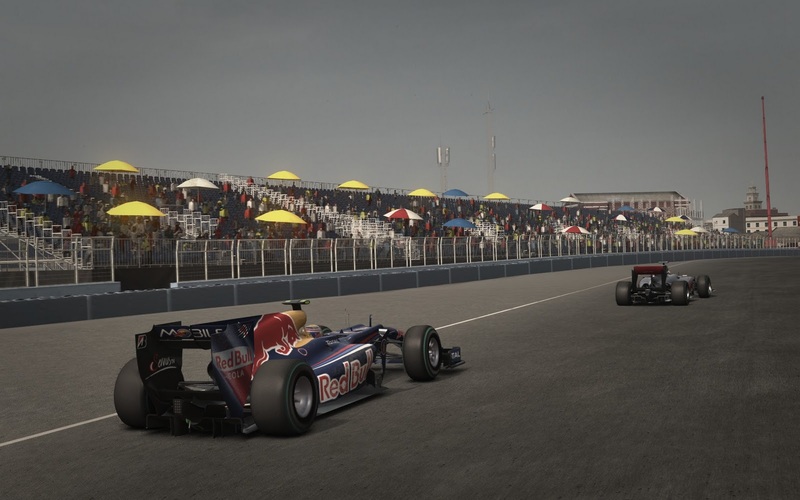 I took care of it within the first lap and went on to have a slow and quiet run as there were few cars out at the time, and I wasn't able to find any pace or develop a rhythm, only improving my time in minor increments. I also had a minor spin on the curb exiting the bridge (turn 10), and my final lap was impeded by a bunch of slow cars. On my way into the pits I was also given a 5-spot grid penalty for speeding in pitlane. This is the fourth grid drop penalty I've had in as many rounds and it was frustrating because I wanted to break that trend this weekend, but the penalty itself was fair as the reason I was speeding was due to the tricky entry pitlane has. Situated on the final hairpin turn, it's rather abrupt as you still navigate the hairpin, sort of, and then as soon as you have done so you need to hit the speed limiter because you are directly in the lane. Most other circuits have a bit of tarmac that preceeds the lane that gives you the chance to prepare for entry, but as it is immediate here it caught me by surprise and I was reprimanded (rightfully) as a result. My fourth run was fairly lackluster despite my attempts to wrestle the car (on purpose) around Valencia as I tried to find some pace. I didn't improve my time at all and received another warning for corner cutting, too, on the brief right-hander before the final turn. There was also another minor spin at turn 12, the corner at the end of the first back straight. I changed my setup again for the fifth run opting for lower downforce and higher top speed. This, combined with more grip now that some rubber had been laid down around the track, should have resulted in some improvement but ultimately didn't as I had some more issues during the run. I had to abort my first lap after brushing up against the wall exiting turn 3 and had my second lap affected by some slow traffic who were entering the pits just prior to it, ensuring a less than ideal entry onto the main straight to commence the lap. I was also still feeling uncomfortable, too, my efforts to find pace or push the limits resulting in no gains, despite how quickly I learned the track's layout earlier in the session. Unlike other venues my ability to learn a circuit quickly just wasn't paying off here, and it was definitely starting to affect my mental state for the weekend. This continued into the sixth run, too, as I had to abort my first lap yet again due to traffic. I also had another spin in the corner at the end of the first back straight (turn 12) which was fine until, as I waited for traffic to pass so I could recover, I was given three warnings for illegal blocking by the stewards. I understand that it's tight down there and as such, I was close to the racing line, but what else was I supposed to do as my rivals approached? I didn't want to get in their way or block their laps while I was recovering, after all, so I thought it was best to just wait. Guess I was wrong, however, as these warnings resulted in another 5-spot grid penalty -- my second for the weekend and this session -- which I thought was unfair but the officials obviously deemed it to be unsafe. In frustration I threw the car around a bit for my final lap which, ironically, was faster initially but didn't yield any improvements as you'd expect. I finished the session 14th on a 1:45.731 which isn't too bad but I definitely felt as if it should have been better, too. It doesn't really matter now, though, with two penalties basically ensuring a race at the back of the field. Hamilton topped the time sheets and Button and Vettel followed him closely behind. I had mixed feelings about the rest of the weekend entering the second Practice session after my guaranteed 10-spot drop. I wasn't feeling particularly motivated, and I was debating with myself as to how I'd approach things now that my chances weren't as positive as I felt they should have been. On one hand, as a response to my situation, I felt like approaching it lazily and perhaps being a bit blasé, but on the other I'm a professional race driver with a job to do and who should always be striving to do their best, so I was torn between a more relaxed attitude (with any decent results being a nice surprise) and doing what I'm paid to do. Somewhat unusually, this was perhaps a little evident in my actions as the session commenced, as I went against my normal trait and sat in the garage for ten minutes letting the others do their thing while I waited. This was nice as I was able to watch the timing monitor for a while and see what the others were up to, but when I did eventually go out it meant that I was doing my first run with a busier circuit, with more cars on track. This meant that I had to abort my first few laps due to slower cars in front and traffic in general, an issue that was becoming particularly prevalent here in Valencia. I also made some mistakes and had another spin off the bridge (turn 10), too, which didn't help things. My second run was fine, if a little lackluster, the only thing of significance being two warnings for corner cutting. 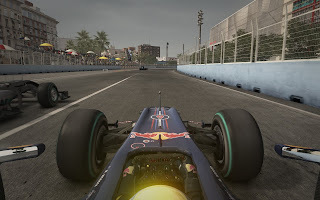 The first of these happened at the final turn and the second at the end of the first back straight (turn 12), but since I have never actually been penalised for cutting corners (yet) I didn't mind too much and ignored the warnings, for the most part. The third run was, once again, about fulfilling Virgin's testing requirements, a time of 2:12.755 (which is actually even more lenient, slightly, than P1's goal, interestingly enough) being the goal this time around. As usual I took care of it immediately then went on to find a little bit more pace throughout the run, despite still feeling a little unmotivated and as if I wasn't "in it" this weekend. I also got another warning for cutting the right hander that preceeds the final turn (turn 24), but like before I didn't take much notice. I did pay attention to the spin I had off turn 5's curb, though, as it highlighted to me that I just wasn't concentrating enough as I got front wing damage, once again, as I was sent towards the wall. Despite being minor damage overall this put a damper on the session -- not that it changed my mood all that much anyway, considering I was already feeling down -- and I went on hoping for the session to end so I could put the day behind me. I had no time improvements in the fourth run and also had a somewhat strange issue where the team told me over the radio about yellow flags in sector three, yet every time I arrived (it probably happened about three times) there was nothing there. That was off-putting because I was intentionally slowing down each time to be ready for anything that might be there and nothing eventuated, which I found to be a little bizarre. Virgin informed me to watch my revs in the final run as my engine was apparently showing signs of wear, news that added to my seemingly negative weekend as you might expect. The run also ended up being a non-event, too, as I got some wheelspin as I changed gear out of turn 3 and clipped the outside wall as I corrected it, sending me spearing into the opposite one and damaging my wing yet again. I recovered to the pits with no hassles but there wasn't enough time to go out again, so that was the end of the session for me. I finished 15th with a time of 1:45.215 which was faster than my P1 time but still average and off the pace. Vettel was on top whilst his team-mate Webber and McLaren's Hamilton were second and third respectively. For someone who is supposedly good at and enjoys street circuits, my performance and circumstances thus far at both Monaco -- an abysmal round for me -- and here in Valencia have been terrible. Here's hoping tomorrow is a little better. I woke up feeling better today and a little more optimistic too, something that should and did help with confidence, concentration and enthusiasm during the morning Practice session. It began with more R&D testing in the first run, a time of 1:55.842 being expected and something that, as always, was easily achieved on the first lap. Interestingly Virgin elected to keep my worn engine in for this session and, indeed, the weekend, opting to try and save some of our others (out of an allocated eight for the season) for future rounds. This made sense strategically considering that Virgin are a new team with limited resources but it was a little frustrating for me personally, because it could have affected our car performance for the weekend but didn't appear to in this session. Thankfully. Like yesterday, traffic became an issue quickly and made itself known in my second run, as did my personal problems with turn 10 off the bridge and the final turn. My first lap was hampered by Adrian Sutil who was exiting the pits and decided to swerve abruptly to get on the racing line, as opposed to waiting for me to pass. This forced me down the run-off area behind turn 2 in a similar manner to my offs leaving the pits in P1, which was a little unnecessary. My third lap also had some drama with Karun Chandok causing Hamilton (who was also in front of me) to hesitate and thus slow, the two of them together blocking my path heading into turn 4. This was entirely Chandok's fault and Lewis even came up to me after the session finished to make sure I knew that he didn't mean to get in the way, which I thought was nice of him. 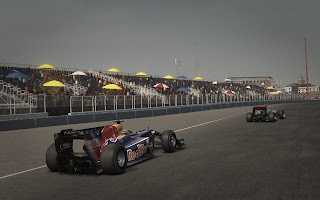 While preparing for the next lap (still on lap 3), a slow Vettel moved aside at the last minute as I approached the final turn, forcing me to throw the car at the apex in order to make it. Naturally this caused me to cut and I was warned, but I accepted this warning in my stride as I didn't feel as if this particular mishap was my fault. The last lap of the run also saw another minor spin at the turn 10 hairpin exiting the bridge, but there was nothing to be concerned about with that one. My third run was fine save for more traffic issues. Seriously, if someone is exiting the pits as you navigate the flatout turn 1 then that lap is basically ruined because no one moves out of the way or stays offline until you pass. It's so bad I actually collided with Sebastian Buemi on my third lap -- my front right with his rear left -- because he didn't see me coming and went straight onto the racing line. I didn't receive any damage but he didn't receive any penalties or warnings over it, either, so it was incredibly annoying. And what's with the traffic problems anyway? This track is huge and far wider than most other venues we visit. There shouldn't be a problem at all. The final run was also fine save for the inevitable traffic problems, my plans to use the Option tyres (which I had finally switched to after spending the entirety of yesterday using the Primes) not coming through -- I did improve my time and progress forward as you would expect using the softer compound of rubber, but I couldn't nail any of my laps because of the aforementioned traffic so I didn't get to see their full potential. I finished the session 11th which was a nice enough improvement, on a time of 1:43.702, my fastest for the weekend. That was because of the Options, of course, but I also felt as though I found some pace and picked up my performance in that session, so it was a nice reward to see myself move forward after the less than ideal events of yesterday. Vettel was on top again and Webber and Hamilton rounded out the top three, repeating the front results of P2 yesterday. An interview after the session asked if the team have been happy with my Qualifying performances so far, and how I have been coping with the testing ban. I responded by saying we’ve been doing okay with Quali so far this season, and we are dealing with the lack of testing the same as any other team, really. Now that things seemed to have turned for the better, I look forward to tackling Valencia under Qualifying conditions later this afternoon. Note: All images, save for the course map, were provided courtesy of Xbox Live friend and fellow F1 fanatic Rossa AU -- thanks yet again man for all your help.